Rod came through the youth system at Watford and was regarded as an exciting prospect when playing for England schoolboys. He made his debut aged 17 at Arsenal in the old First Division, and went on to make nearly 100 appearances for the club over five seasons. He joined Carlisle in 1993. He retired after playing for Brighton & Hove Albion in 2001, and spoke to Watford Legends in 2010. Hi Rod, thanks for talking to Watford Legends. You came through as a youth player. Why Watford? As a nine year old there was a local team in Harrow called Parkford and the manager there was a Roger Broadhead. He was quite well connected with Watford and suggested players that he thought could do something in football. I used to go to the YMCA in Watford for training sessions with John Barnes and Nigel Callaghan. At the time I was better at athletics than I was at football, but I fell in love with football and it went from there. There were quite a few London clubs interested in me and I went to West Ham for a couple of days and after going there it made me realise what a close knit club it seems to be. Everyone seems to know everyone amongst the players, fans staff, groundsman etc. And it seems to be a little that way even today. How did that then evolve for you to become professional? The players that I trained with at the YMCA as an 11 and 12 year old were the players I would train with right through the ranks, all under the mentorship of Tom Walley. When I was older I then got the schoolboy forms and went to Lilleshall with Jason Soloman and Jason Drysdale. We had two years there and went back to Watford as 16 year olds and went in to the youth team. 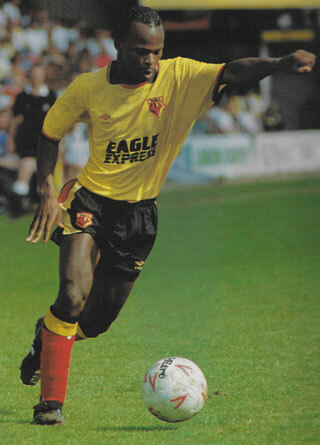 Watford had a very good youth team at the time with the likes of Barry Ashby and David James also there. I made my debut at Arsenal when I was 17 years old. I remember arriving on the bus and I was in awe of it. The main thing for me was that the dressing rooms had heated floors! I knew I was going to be a sub but I wasn’t expecting to play. But I got on with 20 minutes to go and managed to set up a goal for Rick Holden which was nice. I was playing against one of my idols in Kenny Sansom that day. It’s a great memory. You played a fair few games in a few years. Do you have a stand out game? I think your debut is always the one. I remember making my full debut at Luton when they had their plastic pitch. That is an easy game for a full debut! I remember I had a great game against Leicester at home when we won 3-1. Even though I didn’t score it was one of those games where as a winger you have a great day. The England team were watching and off the back of that performance I got a call up to the Under 21’s which was brilliant. I also scored a great goal against Leeds by lobbing Mervyn Day for a 1-0 win! Little did I know that Mervyn would go on to be my manager at Carlisle. Overall that Leicester game is my favourite. Was the Leeds goal your favourite? No I think my favourite goal would be a header I got against Sunderland at home. I like that one as I didn’t get many with my head. Are you still in much touch with any of the old Watford lot nowadays? Yes I am. Watford seem to do well with producing good managers and coaches, and having been around the football scene for all these years you tend to bump in to people, such as Gary Porter, David James and Gibbsy. The thing I notice now when I’m out and about, such as at the Masters, my old team mates always talk about Watford with a lot of affection for the club. Because this is a Watford based website, we tend not to talk too much about your time with other clubs. But why did you go to Carlisle?! 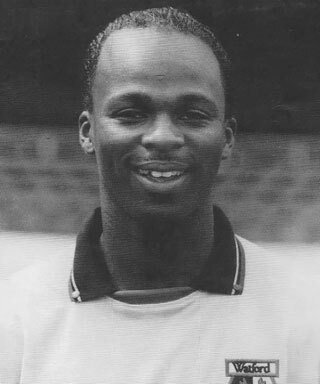 A good friend of mine was another player called Robert Peters. He played under Steve Perryman at Brentford. He used to say to me after games that Steve Perryman had been saying things about me. Not nice things. Which was odd to hear as I’d never come across Steve before. Colin Lee left and Steve Perryman took over. I was in the changing rooms and the first thing Steve ever said to me wasn’t hello but “How’s your mate Peters?” It was so strange. I just think he didn’t like me as a person. I was in and out of the team under Steve for a couple of years. I knew that I wasn’t going to play under him. He sat me down one day and said that after 12 years he thought it would be a good time to move on. I left the club and went on holiday to Tenerife with Jason Drysdale and Solly as well as a few others. When we got back I headed back over there to have a bit longer. I was having a kick about on the beach and a man walked up to me and told me he was the Technical Director for FC Tenerife. So I ended up doing some training with them. They asked me to stay with them for three months. Unfortunately though I declined as I was very disillusioned with football at the time. My intention was to have six months off. I had had enough of the game at the time to be honest. One of my coaches in my youth career and at Lilleshall was Mick Wadsworth. I got a message from my mum, as it was in the pre-mobile days, and she told me that Colin Lee wanted me at Reading and Mick wanted me to go and see him in Carlisle. I didn’t know where Carlisle was. All I could remember was that Dean Holdsworth had gone up there on loan and couldn’t believe how close to Scotland it was! Mick told me that he planned to get rid of all the old pros that were at the club and try to bring in a bit of youth and try to make it exciting. Which it certainly was – in four years we had two promotions, two relegations and two Wembley appearances. So what is the day job since you hung up your boots seven or eight years ago? I was previously working for T-Mobile on the sponsorship side of things which was interesting. Now I help my brother who has done well for himself running salsa and comedy workshops. I also help out at weekends at a football academy that is run by a friend in Lincoln. Well good luck with everything and we hope to see you at The Vic soon. Cheers boys. All the best.